Product #5416 | SKU FSW52901 | 0.0 (no ratings yet) Thanks for your rating! Enables a connection between flash sync cords and the camera body. 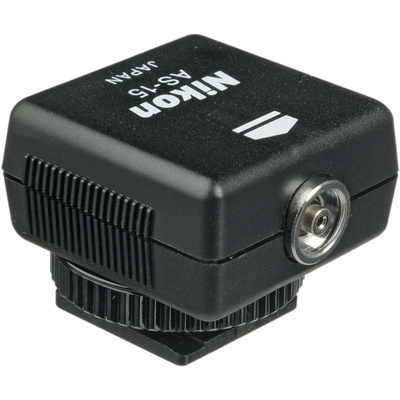 The Nikon AS-15 enables the connection of flash sync cords fitted with standard PC-type connector to the camera body via the built-in hot shoe. Designed for use with Nikon cameras with standard ISO-type accessory shoes that do not have a sync terminal. Note: This does not provide high-voltage sync protection, and is not recommended for flash units that have more than 6v.